Home → Across America → Dog Saves Abandoned Newborn Baby — FAKE! FAKE! FAKE! Additional photos of the dog and what he is carrying on this page —–> Dog carrying discarded fetus photos. The Facebook Simpletons — a distinct ethnic group unto themselves — have been spreading around the dumbest story ever! They have out-simpletonized themselves with this one. They have defied science, perspective and good taste. They have gone beyond the pale of stupidity. Yes, the morons who love to share heart-warming and fake stuff on Facebook, are at it again. 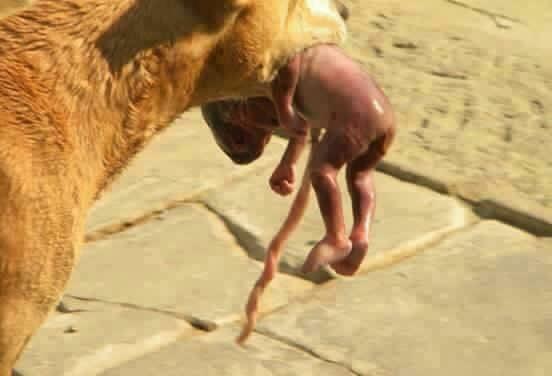 This time it’s a photo of a street dog holding what appears to be a newborn baby in its jaws. The moronic story that comes along with this grotesque story tells of how the angelic dog — a lovable messenger from heaven — carried the baby – which had been ditched in a garbage can – to the front door of a nearby house where the owners then contacted the police. The stupid story goes on to tell how the baby is alive and well thanks to the dog. Soooooooooo not true. There is one huge problem with the story — THE INFANT IS DEAD – and this dog is either gigantic or this is a fetus about 6 months gestation in the jaws of an average sized dog. Sorry, but this is an averaged sized dog and what you’re seeing is a DEAD baby about 3 months premature. Additional photos of the dog and what he is carrying on this page —–> Dog carrying discarded fetus photos. How do we know that the baby is dead and that the whole story is fake? Read on. The easiest way to know that it’s fake lies in the simple fact that it is a feel-good Facebook share. THOSE ARE ALWAYS FAKE, but the purely scientific way to know that this infant.fetus is dead is the fact that the lower back has what is known in forensic science as LIVIDITY. Do you see the ruddy area around the buttocks Do you see the dark red mottling? Not only is this baby dead, it’s been dead for several hours at least. LIVIDITY is what you find in a corpse in the hours after death because the blood settles where to the bottom of the position in which the body was laid out. This baby was in a seated position and the blood ( lividity) settled in the buttocks and the rear of the thighs. Marilyn Monroe died sleeping on her face. The LIVIDITY was found therefore found on the front of her body and her face. This same principle applies to this poor baby. Rumors say that this happened in Saudi Arabia — what difference does it make? It’s fake. It’s NOT fake that the dog has a dead baby in its jaws, but the whole story about the dog rescuing the baby is totally FAKE.